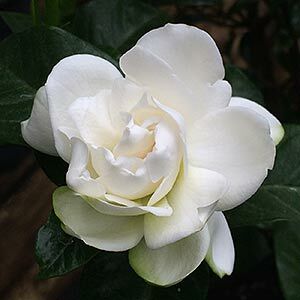 One of the best gardenias for its free flowering nature, Gardenia ‘Professor Pucci’ also has a good upright habit. Large double flowers are fragrant, a clean white when when first opening fading to a buttery golden yellow. 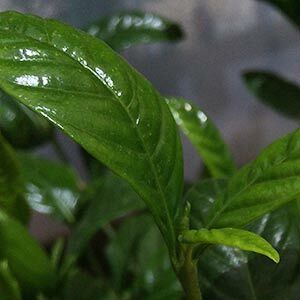 Foliage is a good glossy green and ‘Professor Pucci’ has a number of landscaping uses. Used as a feature plant, or a background plant in the border where the foliage acts a good contrast to other plants. This is a gardenia that can be planted as a hedge, its upright habit makes it one of the better varieties for this. Excellent as a container plant when planted near outdoor living areas so its fragrance can be appreciated. With a natural attractive rounded habit, and good foliage this is a gardenia that os well suited to a range of landscaping applications. Best planted in a slightly acidic humus rich soil. Water in well after planting and consider staking newly planted specimens as this can reduce rocking in the wind and assist with root development. Mulch around ‘Professor Pucci’ top maintain a cool moist root run. After planting, water regularly with a liquid seaweed fertiliser to help with root establishment. Water deeply through the first summer if soil begins to dry. Position – Best in a warm sunny position sheltered form cold winds and the extremes of the afternoon sun. Soil – Humus rich, moist but well drained. A slightly acidic soil works well. Growth rate – Regarded as medium. Flowering period – Early summer through to autumn. The best time to prune Gardenia ‘Professor Pucci’ is after flowering. Regular yearly pruning will ensure a dense bushy habit and an abundance of flowers. Where can you buy Gardenia ‘Professor Pucci’ ? Monbulk – Silvan Rd Monbulk.